Home / Editor's Choice, Entertainment News, Featured Articles, Forum and discussion, Lifestyle / DCI names rogue bank managers arrested for stealing millions from customers in these 4 banks. DCI names rogue bank managers arrested for stealing millions from customers in these 4 banks. 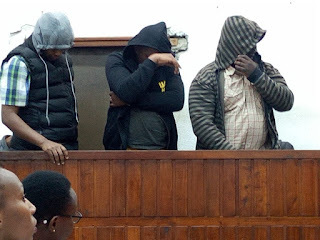 Monday, August 20, 2018 - Director of Criminal Investigation (DCI) boss George Kinoti named and shamed four rogue bank managers arrested for stealing from unsuspecting customers. The four are accused of stealing money from their clients running into millions. Taking to social media, Kinoti who has been working round the clock since he took over from his predecessor, Ndegwa Muhoro, named the suspects and their banks. For instance, one Peter Nyakomitta a Diamond Trust Bank Kisii branch manager, is accused of stealing a whooping Sh25 million. Mr.Peter Sungu Nyakomitta, a Branch Manager with Diamond Trust Bank (DTB) in Kisii was arrested and arraigned in Milimani Law Courts for stealing Ksh.25 Million from customer’s fixed account numbers. The theft was discovered after an internal reconciliation process was done.